What do you remember from your days in college? I remember a whole lot but one of the things that I will never forget is the main “gadget” that I rarely was without. The calculator. I did go through several calculators (which is understandable considering how long I stayed in school), but one thing was the same: they all were scientific calculators. I can’t say that I am obsessed about calculators, but they did serve their purpose and for that, I retain a certain fondness for them. Sure, there are all sorts of virtual calculators to be downloaded for practically any mobile phone (and other similar devices), but you have to admit that there is something about old school that cannot be replaced. If you have a fondness for calculators – for whatever reason – you might be interested in what HP has to offer. After all that noise about the company letting go of it’s computer arm of the business, it’s not really a surprise that HP is going back to the basics. If you are of the right generation, then you would remember the HP12c financial calculator, which was considered to be an innovation back in the day. Among businessmen, this is THE calculator. To celebrate their 30th anniversary, HP has decided to the things that have made them a fixture in many a person’s office or study: calculators. 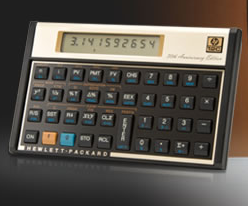 They have released two of their vintage items – the HP12c financial calculator and the HP15c scientific calculator. The HP limited edition calculators may be a throwback in time, but they can still hold their own among any “modern” calculators that you pit them against. The first of the HP limited edition calculators – the HP12c – is still the industry choice when it comes to financial calculators. Its selling price is $79.99. The HP15c, on the other hand, is perfect for engineers and scientists – heck, anyone who has a propensity for these gadgets! Its selling price is $99.99. Buy them from the HP web site. Calculator leaves the some specific place on the life.because All life we do the calculation like simple calculation or scientific Calculation then we use the Calculator.